We Launched Our Crowd Funding Campaign! We are so excited to share with you that we launched our crowd funding campaign for the month of August and hope you will join us with Generosity! Funds raised from this crowd funding campaign will help us start scaling as a national organization and we'd love for you to join us in helping make that happen. Thanks to Burden Bearing Baskets, we have a fun hand-written calligraphy logo that you can get on a variety of products to show your support and help us share our story! 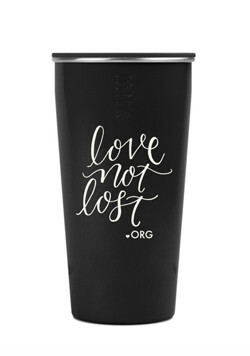 We've partnered with Miir to bring you the best for your on-the-go beverages that will not only benefit Love Not Lost but help water projects around the world. As much as we love throwing a good party, a physical event limits the number of people who can come. Because we are nearing a milestone of starting to scale and expand across the US, we want everyone to have the opportunity to join us in making it happen. Will you help us share our story? Whether you choose to support the campaign financially, we need all the help we can get in spreading the word about what we're doing. Will you please take a moment to post on Facebook and share our campaign? If you like Instagram or Twitter better, that's cool too! Thank you in advance for all of your support and generous giving. We truly can not do this without you!